Take aerobic routines to the next level with rubber gym flooring built for durability and high performance! 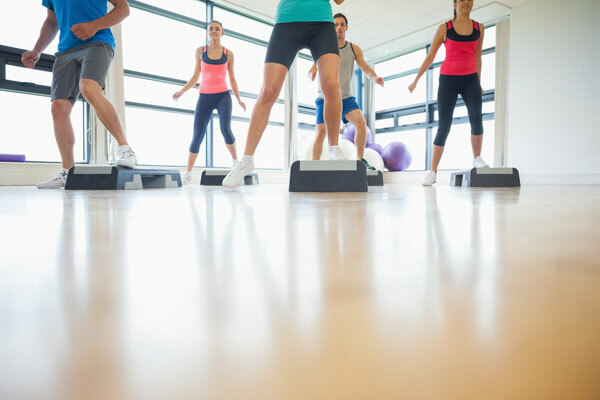 If you have ever been inside a gym, you know the importance of quality fitness flooring. Every day, hundreds of people will march on the rubber gym flooring, do yoga, leaping cardio exercises, and set heavy weights on it. Flooring needs to endure intense abuse, splashes of water and sweat – all while looking good. We offer a large selection of rubber gym flooring that is designed to not only look great but to excel under the harshest conditions. Whether you have a thousand people doing hours of jumping jacks and plyometric exercises, or a schoolroom full of young children, we have flooring that will thrive and provide the highest quality performance. All of our fitness flooring is made in the United States and is environmentally friendly. You can find it in spinning rooms, cardio and warm up areas, locker rooms, swimming pools, senior centers, school classrooms, and stadiums. Our flooring doesn’t just look good in the lab – it has excelled under real-life conditions. We have worked with hundreds of gym owners to develop a rubber flooring product that is perfect for all applications. We are a full-service contractor, which means when you work with us, you are getting an entire professional design team at your disposal. We will discuss your unique needs and develop a design concept that will incorporate the natural advantages of your space to make it look fantastic. We will match the colors you need and install our long-lasting fitness flooring. Remember, when you hire Dynamic Sports Construction, Inc. for your rubber fitness flooring needs, it’s all about keeping you satisfied. We will not recommend a product that won’t work for your needs. By now, you probably have plenty of questions about your new flooring – and our friendly employees are ready to give you some answers. Call us at (800) 517-0015, or contact us through our online form today, and we will be happy to discuss your future flooring needs. Don’t settle for less when you can get the best!